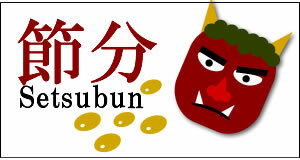 Setsubun is a traditional event held every 3rd of February, the day of turning of the season from winter to spring in accordance with the Japanese lunar calendar. On the day of Setsubun, people throw parched soybeans inside and outside of the house to drive out demons bad luck and to welcome in good luck, and this custom is called Mamemaki. - From JR Omori Station on the Keihin Tohoku-sen Line, take a bus bound for Ikegami Station 〈20-min ride〉. and get off at the bus stop "Honmonji-mae". A 5-min walk from the bus stop.